Please refer to our stock # TBD00247 when inquiring. 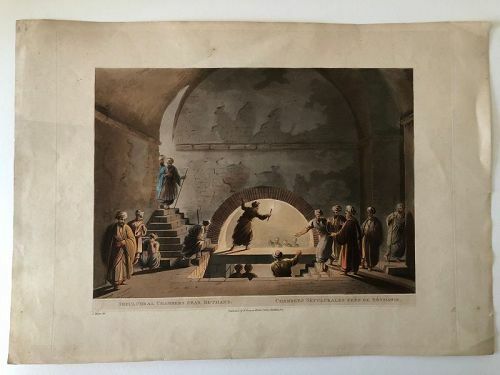 A hand colored engraving titled Sepulchral Chambers near Bethany (also in French) after a drawing by Luigi Mayer (1755-1805) published in London in 1803 by R. Bower as part of the set of prints, “Views of Egypt, Palestine and Other Parts of the Ottoman Empire.” The paper with a watermark, “J Whatman/1801” on the right hand edge with the lower part of the date missing. A dramatic view of men in local dress in a tomb lit with torches. The sheet is 12 7/8 (22.5 cm) by 18 ¼ inches (46.5 cm). Plate mark size is 12 ¼ inches (31 cm) by 15 ¼ inches (38.5 cm and the image without lettering is 8 ¾ inches (22.5 cm) by 12 ¼ inches (31 cm). Condition: Some wear around the edges, a few bends and a couple of minor scratches, but over all good condition and the color is crisp. Unlikely to have ever been framed.